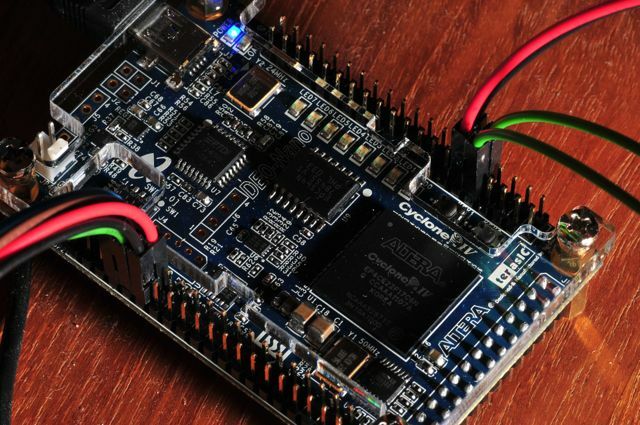 DE0-Nano has a large Cyclone-IV FPGA, a lot of DRAM, some tiny buttons and leds, and a lot of header pins all on a very small board. 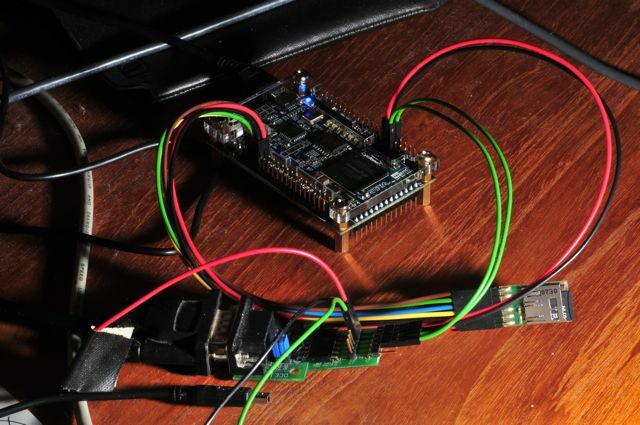 Oh, and an acceleration sensor and an 8-port ADC as well. As with all Terasic stuff, it is very beautifully made, neatly finished with a plexiglass cover. It’s a bit more difficult to run a PDP11 system on it than with the other Terasic boards – you’ll have to connect RS232 level converters and SD card connectors to the headers somehow; this really calls for careful pin counting, and you’ll have to know your way around the design tools as well, because you’ll have to assign the pins and change the top level VHDL module to assign those pins to the right signals. What I did was connect some of the Digilent and Trenz PMODs that I had lying around directly onto the headers using jumper wires. Easy enough to do, but exactly replicating what I did means you’ll need exactly the same PMODs as well. One of the next plans I have is to design a small PCB in the exact same size as the DE0-Nano board itself so that it can be stacked on top or underneath the DE0-Nano, and use that as a connector board to plug PMODs in. And maybe I’m going to put some components directly on that board as well, I haven’t decided which ones yet though. Anyway, Digilent’s idea of PMODs is very clever; even though I’ve always hated their 6-pin single row standard, the concept of having a modular plug-in system with a lot of different simple small boards really works very well. So joining Altera’s FPGA’s and tooling and Terasic’s quality boards to the flexibility of Digilent’s PMODs… Yes, that will work for me.